This range combines Black Pine polyphenols with hexapeptide-11, which is proven to double skin elasticity and strengthen the connective tissue retaining skin firmness and resilience. The range consists of two daytime moisturisers (one for normal - combination skin and one for dry - very dry skin), one night cream, one eye cream, one serum and one oil. I really like the classic black and white packaging and the first thing that I noticed when I opened the products was the scent - it's warm, similar to amber but don't worry if you don't like scented products as it quickly dissipates once the product absorbs. For reference, I have dry and sensitive skin and I didn't have a bad reaction to the scent but one of the products makes my eyes water and this may or not be related to the scent - read on for more details on which one. Korres Black Pine Anti Wrinkle Firming & Lifting Eye Cream: I'm starting with my favourite product from the range! First of all, it has a pump, which I love on an eye cream and secondly, it has a beautiful light cream texture, which absorbs easily and quickly. My whole eye area looks much firmer and plump since I began to use this eye cream - I look less tired and my concealer is applying so much more smoothly because my fine lines are very diminished. A few people have said that I look fresher & less tired, which is a minor miracle in itself, given how ill I am! If you are concerned with fine lines or wrinkles around the eye area, then I would highly recommend giving this eye cream a go. It can be bought in Debenhams for £36/€43.20. Korres Black Pine Anti Wrinkle and Firming Face Serum: This serum comes with a dropper/pipette, which I like as I can control how much product I use. The serum itself has quite a thick liquid texture, yet it absorbs quickly and it delivers a powerful dose of moisture, without any oiliness or greasiness. I think I will have to use it for a longer period to quantify its firming properties, but after 6 weeks of use, I can definitely say that overall, my skin is looking plump and less tired. Due to the texture, I only need to use 2 drops per use so I expect this to last quite a while and it is firmly part of my daily routine now. £39/€46.80. Korres Black Pine Anti Wrinkle Firming Day Cream: I'm quite fussy when it comes to moisturisers - my skin is very dry so I always prefer a cream to a lotion, and I also like a little 'slip' in the texture but don't like to feel that it's sitting on my skin. I also like to feel the effects of the moisturiser for hours after application. This moisturiser delivers on all of my demands, thankfully and my skin has a lot more bounce to it since I started using this whole range of products. The tub contains 40ml and I have used it almost daily since receiving it and have barely made a dent in it.£39/€46.80. Korres Black Pine Anti Wrinkle and Firming Night Cream: There is only one night cream available (compared to two day creams, depending on your skin type) and it is slightly richer in texture that the day cream, but not hugely so. My skin instantly feels softer when I apply this cream and I wake to plump, soft, comfortable skin. I can't really comment on the anti-wrinkle aspect of this cream because apart from some fine lines around my eyes, I don't actually have any wrinkles yet but I that by using anti-ageing skincare, I can ward them off for as long as possible. £39/€46.80. 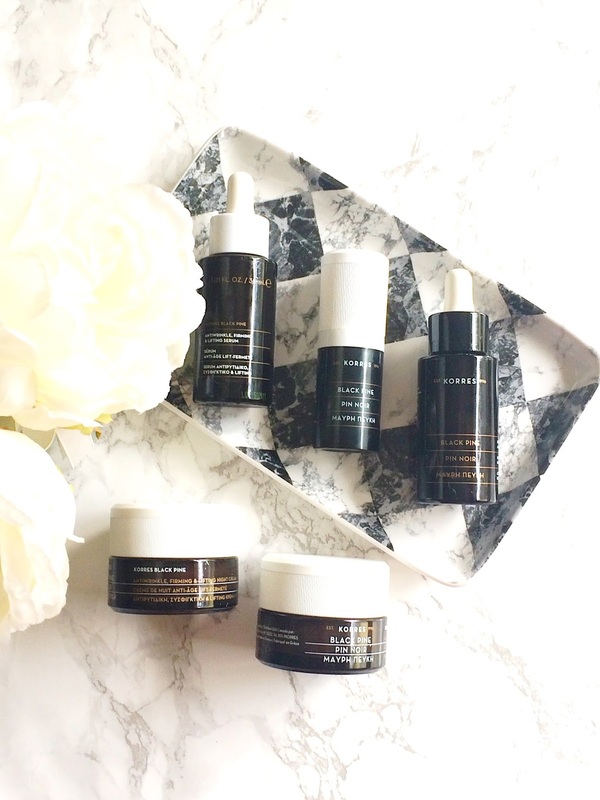 Korres Black Pine Advanced Firming Active Oil: I love a good facial oil, as regular readers will know and the Korres Wild Rose Oil is one of my absolute favourites as it really does brighten the skin so I was really looking forward to using this one. Disappointingly, this is the one product in the range that doesn't agree with me - it doesn't cause any breakouts or anything like that but it makes my eyes stream and my lids puffy, I tried using it just on my forehead and cheeks, completely avoiding the eye area but the same thing happened. I'm unsure why but the scent seems to be stronger in the oil than the other products so I am assuming that has something to do with it. I am going to give it to my mother to see how she gets on with it and assuming that she doesn't have the same reaction, I will report back in a few months time with her review - especially the firming aspect. £45/€54. Overall, this Black Pine range has really impressed me. I am enjoying having more elasticity in my skin and especially love the changes in my under eye area. The prices are mid-range (compared to Oskia, Sunday Riley, Verso, Omorovicza for example), but the results are top notch. They don't clog my pores & haven't caused any milia to develop. I will give my final thoughts in a future empties post because I know that I will use every last drop of these products! If you would like to try them for yourselves, you can buy them in Debenhams and don't forget to use your reward card to earn points to redeem against future purchases! Have you tried any Korres products? I would love to hear your thoughts on this range in the comments below! All products are bought by me, unless otherwise stated. In this case, all of these Korres products were sent to me. Opinion is always my own.